Lidar (light detection and ranging) is an optical remote-sensing technique that uses laser light to densely sample the surface of the earth, producing highly accurate x,y,z measurements. Lidar, primarily used in airborne laser mapping applications, is emerging as a cost-effective alternative to traditional surveying techniques such as photogrammetry. Lidar produces mass point cloud datasets that can be managed, visualized, analyzed, and shared using ArcGIS. The point data is post-processed after the lidar data collection survey into highly accurate georeferenced x,y,z coordinates by analyzing the laser time range, laser scan angle, GPS position, and INS information. 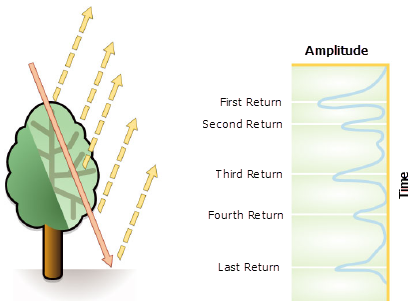 The first returned laser pulse is the most significant return and will be associated with the highest feature in the landscape like a treetop or the top of a building. The first return can also represent the ground, in which case only one return will be detected by the lidar system. Multiple returns are capable of detecting the elevations of several objects within the laser footprint of an outgoing laser pulse. The intermediate returns, in general, are used for vegetation structure, and the last return for bare-earth terrain models. The last return will not always be from a ground return. For example, consider a case where a pulse hits a thick branch on its way to the ground and the pulse does not actually reach the ground. In this case, the last return is not from the ground but from the branch that reflected the entire laser pulse. Additional information is stored along with every x, y, and z positional value. The following lidar point attributes are maintained for each laser pulse recorded: intensity, return number, number of returns, point classification values, points that are at the edge of the flight line, RGB (red, green, and blue) values, GPS time, scan angle, and scan direction. The following table describes the attributes that can be provided with each lidar point. The lidar attributes listed below are not always provided in the final output lidar files. Use the LAS dataset to review the attributes and classification associated with the lidar data. The return strength of the laser pulse that generated the lidar point. The number of returns is the total number of returns for a given pulse. For example, a laser data point may be return two (return number) within a total number of five returns. Every lidar point that is post-processed can have a classification that defines the type of object that has reflected the laser pulse. Lidar points can be classified into a number of categories including bare earth or ground, top of canopy, and water. The different classes are defined using numeric integer codes in the LAS files. The points will be symbolized based on a value of 0 or 1. Points flagged at the edge of the flight line will be given a value of 1, and all other points will be given a value of 0. Lidar data can be attributed with RGB (red, green, and blue) bands. This attribution often comes from imagery collected at the same time as the lidar survey. The GPS time stamp at which the laser point was emitted from the aircraft. The time is in GPS seconds of the week. The scan angle is a value in degrees between -90 and +90. At 0 degrees, the laser pulse is directly below the aircraft at nadir. At -90 degrees, the laser pulse is to the left side of the aircraft, while at +90, the laser pulse is to the right side of the aircraft in the direction of flight. Most lidar systems are currently less than ±30 degrees. The scan direction is the direction the laser scanning mirror was traveling at the time of the output laser pulse. A value of 1 is a positive scan direction, and a value of 0 is a negative scan direction. A positive value indicates the scanner is moving from the left side to the right side of the in-track flight direction, and a negative value is the opposite.